Notes: Net exports equal gross exports minus gross imports. Negative net export values indicate net imports. Strong global demand helped propel distillate exports, as distillate fuel, which includes diesel, had a higher profit margin for U.S. refiners than gasoline. Refiners also had access to increased supplies of crude oil imports from Canada, which in 2011 topped 2 million bbl/d for the first time, and from North Dakota's Bakken formation to process into petroleum products. 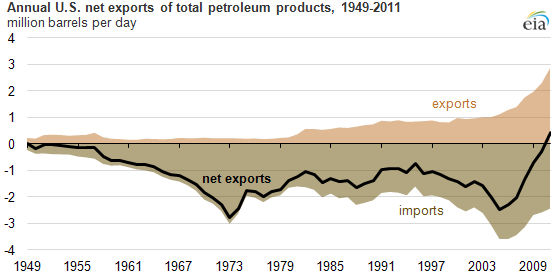 The United States remained a net importer of crude oil, some of which was refined into petroleum products that were then exported. Petroleum products were ranked second in value of all U.S. exports during 2011 at $111.1 billion, up 60% from 2010, according to U.S. Department of Commerce trade data. Vehicles were the number one U.S. export last year at $132.5 billion. 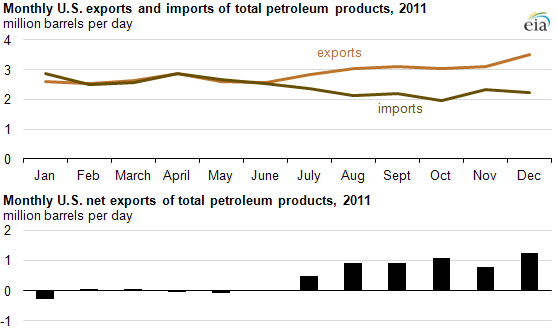 Crude oil was the biggest U.S. import, valued at $331.6 billion, up 32% from 2010. Rising crude oil prices, rather than higher crude oil import volumes, were the key driver of the increased value of crude oil imports.